Two Heath Super Chasers were the machines of choice at the recent Great British Straw Challenge, held at the Moreton Show in Gloucestershire in September. 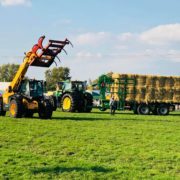 Located in the beautiful north Cotswolds, Moreton is one of the biggest one-day agricultural shows in the UK attracting visitors from all over the country. The 2018 show featured over 350 trade stands, various livestock, a dedicated horse section, a rural attractions area and a grand arena with a number of exciting events taking place. One of which was the Great British Straw Challenge which saw two teams, RJR Contracting and Thomas Gaydon Logistics, using Heath Super Chasers to compete against each other. Contestant Robert Redman from RJR Contracting, was on hand to explain the widely attended competition. 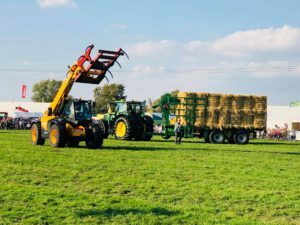 “The Straw Challenge has been a long-standing competition and this year, for the first time ever, event organisers decided to introduce Heath Super Chasers into the competition. The range of Heath Super Chasers have been providing reliable and efficient agricultural solutions for well over a decade. The original Super Chaser was first brought to market in 1995 and quickly made an impression on operators by handling 10 4×4 Hesston bales. This design was enhanced in 2006 when the Super Chaser Extra was brought out with extra capacity, allowing for 12 instead of 10 Hesston (4×4) bales. Equally as popular is the QM Super Chaser which was released in 2002 and was designed to take every other size of big bale except the Hesstons. It takes 14 midi (4×3), 18 quadrant (4×2), 24 mini (3×3) or 27 3×2 bales and bales are stacked on their strings to ensure stability. Following this, the QM Extra was produced in 2012 with an extra 20% capacity. It also features air suspension, radial tyres, air brakes with ABS and hydraulic extensions to the pushers and side gates. Although Robert was on the losing team it didn’t stop him from cherishing the challenge as a memorable experience. “It was so nice to be able to compete in the challenge and it was a lot of fun. I think the Heath family were also really pleased to see their kit being displayed like that and for me – using the machines was the best part of the challenge. 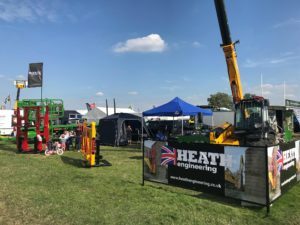 Heath Engineering concluded their busy 2018 event schedule with a successful Moreton Show in Gloucestershire. Visitors took advantage of the fantastic weather with one even purchasing the Heath Bale Grab directly off the stand. The event was so successful that the company has already confirmed their attendance at the 2019 show. Other products at the show included the Heath Super Spike and Super Chaser, with a good number of enquiries taken throughout the day. The show itself has lots of family fun from terrier racing and stunt motorbikes to Tractor Ted and circus skills, as well as celebrating farm to fork with delicious British food. Managing Director Pete Heath was impressed with Heath Engineering’s first appearance at Moreton and commented: “It was a great show that served two purposes; a chance for us to meet both new and existing customers as well as showing them other products which they may not have been aware of. 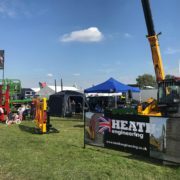 Heath Engineering is an innovative British manufacturer who has been producing agricultural equipment for over seventy years, with many customers learning that equipment carrying the ‘Heath Engineering’ name is synonymous with machines that are built to do the job and will last. © Copyright Heath Engineering. Website designed by Fusion Media 2019. All rights reserved.